A cold gusty wind, concrete skies, the moist smell of rain soon to come, wild turkeys and colorful autumn foliage – – – what a great day to be in the wild! 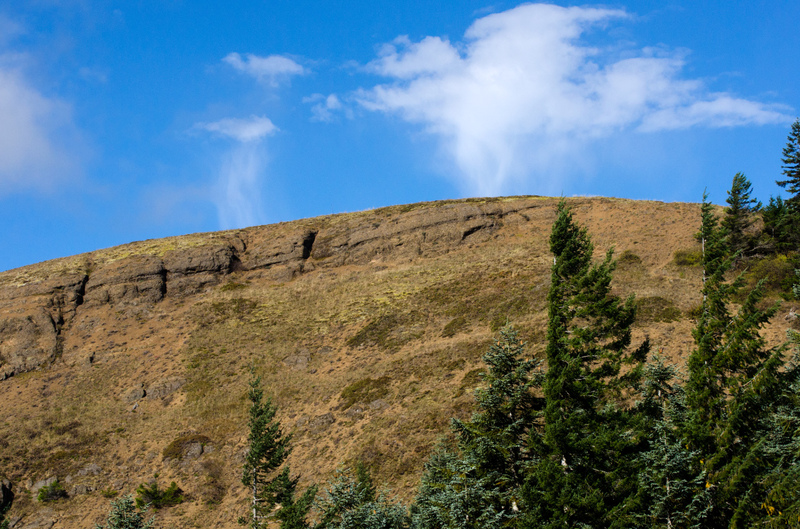 In early October I drove to Triangle Pass and then to the Grassy Knoll Trailhead, about seven miles north of the Columbia River Gorge. From there it was a short climb to the top of 3,648-foot Grassy Knoll, an open, tundra-like ridge crest with views extending to the Columbia River. After a short rest I continued hiking up and down the ridge for another three miles to the Pacific Crest Trail. Within a few feet of reaching the PCT, the steep one-quarter mile trail to the top of 4,202-foot Big Huckleberry Mountain was found. A few minutes later I was at the summit. As I had guessed at the first of the hike, I spent the last three miles of the 11 1/2-mile hike getting soaked in a cold rain. It’s par for the course in the early fall.